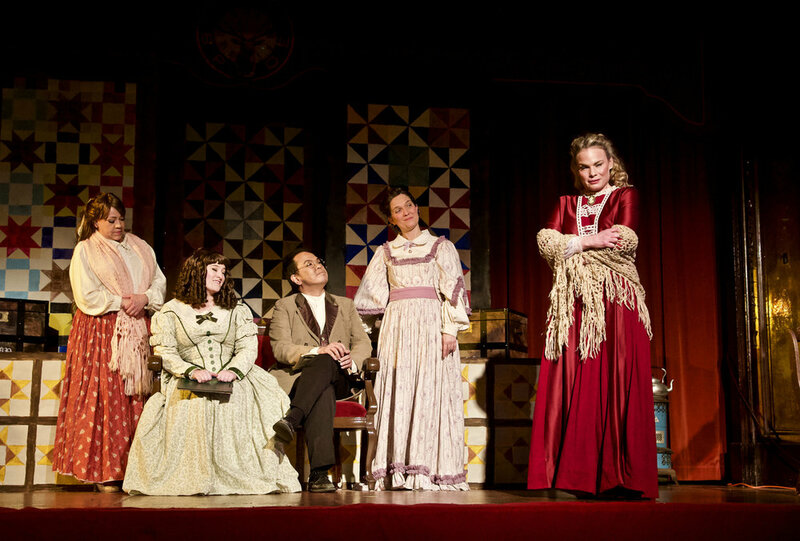 American composer Mark Adamo’s first opera, “Little Women”, was mounted by Island City Opera this month. It was written in 1998 on commission from Houston Grand Opera and was David Gockley’s first of many in his time there before he became General Director of San Francisco Opera. The opera has been performed in over thirty productions around the country and remains his most popular opera. I now see why, though I’ve not seen it before or even heard of it. Mr. Adamo wrote the libretto as well as the music and most of it is in rhyme—no easy task. The music is modern—you wouldn’t mistake it for Puccini—but it is very tuneful and very pleasing to the ear. The story is familiar, closely based on Louisa May Alcott’s classic novel of 1848. Having last read the book over 50 years ago, I was brought right back to the characters in it—the four March sisters, Jo, Beth, Amy and Meg; their parents, Marmie (whose name, it turns out, is Alma) and Father (whose name is Gideon), Laurie, the boy next door, rich and arrogant Aunt March, Brooke the tutor to the girls, and Professor Behr. Ms Alcott based the book on her own family (she did have three sisters). Sergio Gonzalez, Deborah Rosengaus, Bradley Kynard, Katja Heuzeroth. The parts were very well cast and each of the singers brought out the salient aspects of their characters. Jo March (Louisa herself) was played strongly and forcefully by mezzo-soprano Deborah Rosengaus; in addition to singing beautifully, she gave an emotionally rich performance. Meg was sung by mezzo-soprano Katja Heuzeroth, who did an excellent job, though the range of her character was less broad. The invalid sister Beth was sung by soprano Aimee Puentes, doing more with her strong voice because of having limited physical movement (she did a lot of collapsing on stage, but not much else). And the youngest sister was played by coloratura-soprano Angela Jarosz. The parents were sung ably by Jacque Wilson and Wayne Wong. Tenor Sergio Gonzalez made a striking appearance as Laurie and sang his heart out in several poignant scenes. Baritone Bradley Kynard was the tutor Brooke (and Meg’s suitor) and gave an excellent rendering of the role. Aunt March, the mean one, was appropriately sung by co-founder of Island Opera, lyric soprano Ellen St. Thomas. And last but not least, bass-baritone Don Hoffman was a convincing Frederich Bhaer, the suitor of our Jo. Rounding out the cast was a so-called soprano quartet of Leandra Ramm, Chelsea Hollow, Maria Caycedo and Debra Niles, acting as a chorus of sorts, and mirroring the four sisters; and Phillip Harris as a NY newspaper man who gives Jo a break in journalism. A small but effective orchestra was ably conducted by Dana Sadava and the production was directed by Igor Vieira. Aimee Puentes, Angela Jorosz, Wayne Wong, Jacque Wilson, Katja Heuzeroth. 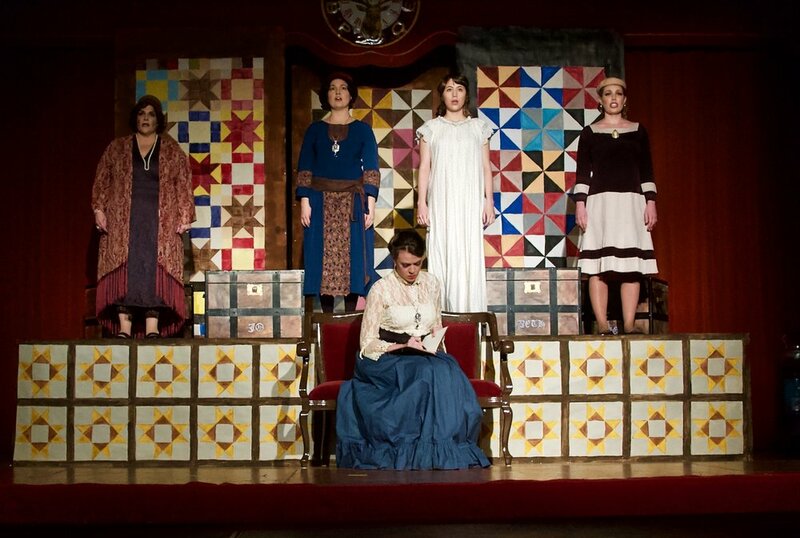 The staging was simple but perfectly adapted to the story—quilts as a backdrop, a few pieces of furniture (including a piano that various people played) and shifts in lighting. It was sweet even to see the “BPOE” logo prominently displayed above the quilts (the performance was held in the Elks Hall in downtown Alameda. The costumes were well-suited to the mid-19th century, and the scene and costume changes worked seamlessly (too many unintended puns there). There were many scenes of great beauty that have stayed with me since the performance. One was, in the first act, when the parents teach their own marriage vows to their daughter Meg and fiancé Brooke before the young couple repeat them at their wedding. The poetry along with the somber yet beautiful music was very evocative of any wedding that I have attended. Another scene, early in the second act, had several characters, each in a different part of the stage, reading letters from another, thus advancing the plot while the singing criss-crossed the stage. There were duets, solos, trios and quartets throughout the performance and some quite beautiful poetry. There were musical themes that repeated throughout the opera which served to cement the music in the brain. Some of the words were Louisa May Alcott’s own (she was a writer of potboiler romances to make a living); and there was a romantic poem of Friedrich Schiller, sung by Professor Behr. Everything about the production, from start to finish, was first rate, and though the voices might not have been suitable for the San Francisco Opera stage (as far as I can tell Aimee Fuentes is the only one in the cast who has sung there) they perfectly filled the sold-out Elks Hall. This might not be big enough to be a contender for ‘the Great American Opera’ but then, again, I’d vote for it as one of the top 5. Go see it if you get a chance. Elsa Tranter is a Bostonian who has lived in Berkeley for over 40 years and has been an opera goer for most of those years. She worked as a graduate student adviser at UC Berkeley and still attends Cal Performances regularly. Her favorite composer is Wagner and her favorite opera is Tristan und Isolde.